What is the Smartkarma Substantiveness Initiative? 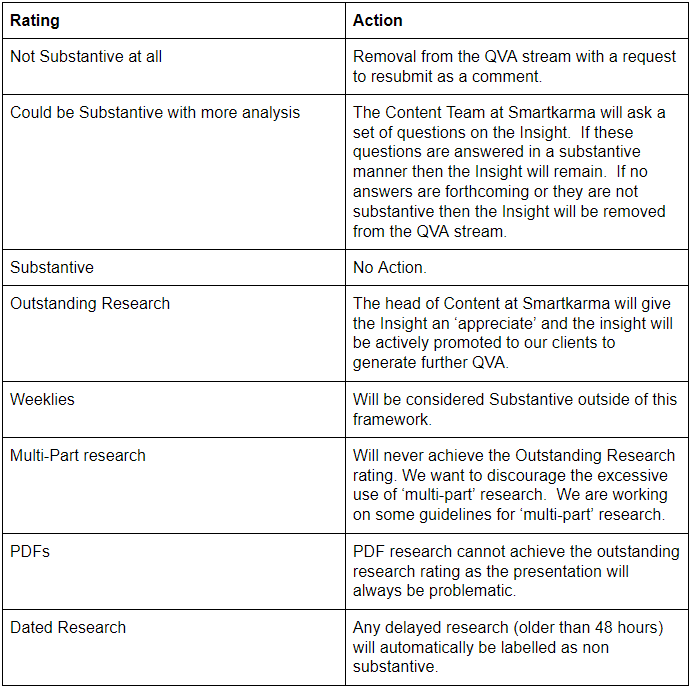 We are consistently asked by our existing and prospective clients how we ensure that only substantive research appears on the Smartkarma platform. Substantiveness is at the heart of good research and is demanded by our clients. The community standards of our Insight Providers also push for more substantiveness. We, at Smartkarma, believe that increased Substantiveness will benefit all, therefore, we have introduced the Smartkarma Substantiveness Initiative (SSI). It is important to note that this initiative does not alter the QVA framework or drive payments in any way. Present the investment manager with meaningful conclusions based on analysis or manipulation of data. We have taken this as the core of the SSI while adding in items of best practice from authorities globally. What is the aim of the SSI? Encourage a general improvement in Substantiveness. The framework is NOT a fact checking service or a measure of our belief in Insight Providers’ opinions. We then identify four strata of Substantiveness and take action that is appropriate to the strata. We have also identified a few special cases with different treatment. The table below details our approach. The SSI is supplemental to QVA and QVA remains the driver of payments from the QVA ‘pot’. The SSI will lead to an overall improvement in substantiveness which will in turn drive more client engagement and attract new clients, increasing the size of the overall QVA ‘pot’. The SSI also works to remove items that divert QVA payments away from substantive research. In this way SSI is beneficial to the IP community as a whole. Finally, the SSI works as a handy yardstick to delineate between an Insight and a comment on the platform. The SSI will lead to a greater interaction between the Smartkarma Research team and the Insight Provider community, to the benefit of all.